Dehong Dai and Jingpo Autonomous Prefecture (dé hóng dǎi zú jǐng pō zú zì zhì zhōu 德宏傣族景颇族自治州), located in the southmost part of Yunnan Province (yún nán shěng 云南省), borders Burma with a boundary line more than 500 kilometers long. Covering an area of only more than 10,000 square kilometers, Dehong boasts featured customs of minorities, colourful culture, long history, and beautiful natural scenery; and therefore, it is famous both at home and abroad, and is called Hometown of Peacocks, Hometown of Legends, and Hometown of Songs and Dances. Under its administration, there are two cities: Ruili City (ruì lì shì 瑞丽市) and Mangshi City (máng shì 芒市), and three counties: Longchuan County (lǒng chuān xiàn 陇川县), Yingjiang County (yíng jiāng xiàn 盈江县) and Lianghe County (liáng hé xiàn 梁河县), with a total area of 11,526 square kilometers and a population of 952 thousand people. More than half of the local people belong to such ethnic groups as Dai, Jingpo, Achang (ā chāng 阿昌), Lisu (lì sù 傈僳) and Deang (dé áng 德昂) nationalities. Among these places, Ruili City has been given the honorable title of Excellent Tourist City in China. Dehong is bordering Burma. It is true that there are mere stones along the boundary line, but it is also true that harmonization does exist as if there is no barrier. Stockaded villages of the two countries stand side by side; veins of one country may creep to the other, and hens may lay their eggs on the other side of the boundary line. There is even one family who has a mere stone in the courtyard so that they have to have their meals in China during the day and sleep in Burma at night. Other interesting phenomena like one well and one island lying in both countries would make your journey even more exciting. You can even have such experience as stretching your foot abroad to Burma and then hold it back to China. It is really wonderful. 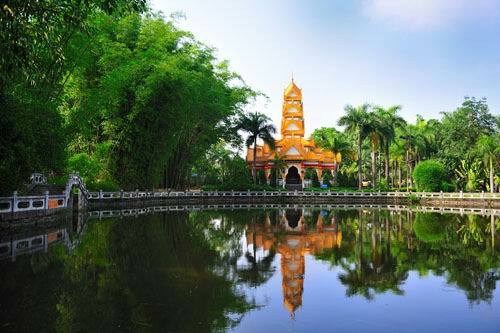 Scenic spots in Dehong Prefecture contain subtropical natural scenes, building of Hinayana Buddhism, customs and culture of the Dai people, Dai style food, border trade and traveling to Myanmar through the border. Ruili River (ruì lì jiāng 瑞丽江) and Dayingjiang River (dà yíng jiāng 大盈江) scenic spots are within the limits of the prefecture, which have a humid and hot rain forest climate typical to the low-Latitudes subtropical areas. The woods shown below is formed by a single tree. In fact, there are thousands of square kilometers of areas that have been covered with such Banyan trees in the whole scenic spots and with the ever - green vegetation, constructing a unique subtropical rain forest scene. Colourful and diversified customs of Dai, Jingpo, Deang and Achang ethnic groups of the frontier areas are best presented in those scenic spots, thus offering a lot of exotic sights for tourists to see. With the development of the border-trade, local land ports in Wanding (wǎn dīng 畹町), Ruili and in some other places of Dehong Prefecture have either become state - level ports or provincial-level ports. As a result, tourists here are able to buy the finest and the cheapest jewels and jade wares in the world. hence, many tourists have a long stay and become businessmen here. They call the travel to this place "An itinerary for purchasing jewels". Arriving here, you can witness a town, even a street, belongs to the two countries; you can personally experience crossing the boundary line several times within one hour, visiting two countries and their respective market places. Through the convenient transportation and procedures, you can go to various places of Myanmar to appreciate the world-famous Grand Golden Pagoda in Rangoon and have a taste of the exotic scenes and folklore of the Country. 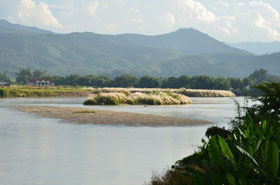 The Ruili River is one of the three major tributaries of the Irrawaddy River. The Ruili River is a river, which flows through tropical areas and valleys. The river expands 53 km in Ruili city with a width of 100-200 meters. The banks of the river are planted with green trees and colorful flowers. The whole river consists of three sections with quite different scenic beauties. 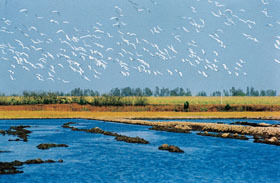 The drainage area of the Ruili River is rich in tourist resources with various scenic spots grouped together. Thus it is a multi-functional tourist attraction characterized by its tropical and sub tropical scenery, border ports, ethnic religions, histories and cultures. Dayingjiang River is a branch at the upstream of Irrawaddy River. It takes its rise from Danzha River and Binglangjiang River (bīn láng jiāng 槟榔江) in Tengchong County (téng chōng xiàn 腾冲县). The two rivers join up with each other in the Old town of Yingjiang County, and then form the Dayingjiang River, which flows through Tiger Leaping Stone and then runs south to the Irrawaddy River in Burma. It finally flows into Bay of Bengal. Dayingjiang River is about 205 km long with 146 km in Yijiang County. The river is 900 meters wide at its widest point and only 7.5 meters narrow at its narrowest point (Tiger Leaping Stone). There are two large branches, Binglangjiang River and Nandi River (nán dǐ hé 南底河), at its upstream. High trees and strange stones can be found along the two banks of Binglangjiang River. The water in the river ran very fast and high. After entering the dam area and joining with Nandi River, the river becomes quiet and winds to the west. 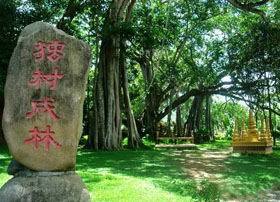 Big banyan trees are easily found along Dayingjiang River area, and Dai villages can be seen among the bamboo forests, which represent typical tropical and subtropical scenery. After winding through hundreds of primeval forests and canyons to arrive at Yingjiang Bamboo forest, the river turns slow and wide. On the two banks are endless farmlands and villages. A bamboo dam spreading thousands of miles stand on the riverbanks, and green islands can be seen in the middle of the river. Blue sky, white clouds, green bamboo and islands that are reflected in the river water, as well as small boats and Dai ethnic love songs constitute a fancy poem. In this scenic spot, there is not only original natural ecology, but also national customs. The integration of natural landscape and ethnic culture has become a feature of the area. This scenic area is based on the Yingjiang Section of Dayingjiang River, starting from Zhina Township (zhī nà xiāng 支那乡) in the north and Mangyun Township (máng yǔn xiāng 芒允乡) in the south. It also depends on the natural ecology of Dayingjiang, as well as numerous scenic spots. It mainly includes seven scenic areas: namely Zhina “Guangbang” drum cultural area, the original place of Dai opera, Old Town Xiang’e Lake area, customs area, Wanxiang old town area and monument of Margary event. 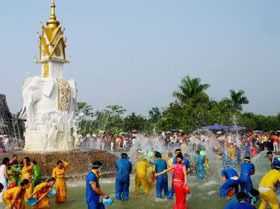 Water-Splashing Festival, Munaozongge (mù nǎo zòng gē 目瑙纵歌) Festival, national sports competitions, beach sports activities and other projects have also attracted many tourists. The tree grows at Laodaonong Village (mù nǎo zòng gē 老刀弄寨) of Tongbiguan (tóng bì guān 铜壁关) in Yingjiang County. It is over 400 years old, 40 meters high and covers an area of 5.5 mu. More than 100 new trunks have grown from aerial roots, which touch the ground. The new and old trunks join together, forming a wonderful one-tree forest. Walking under the tree, you will feel as if you were wandering in a virgin forest. It is the biggest banian tree that has ever been found in China. That is why it is called the king of the Banian Trees in China. Standing on the side of the Fenghuang Hill (fèng huáng shān 凤凰山), the tree is over 20 meters tall, and its trunk has a circumference of 3.2 meters. This tree is 90 years old, and is called "the Mother of the Rubber Trees in China" or "the First Rubber Tree in China", which has been ranked as a tree under national protection. Munaozongge means “let’s dance together” in Jingpo language. Long ago, the earth was covered with dead silence without even a slice of happiness. On the contrary, the Solar Palace was full of boisterous singing and dancing. Curious, birds of all species went to the palace for a clue. Finally, hornbill and peacock brought back with them the secret of the palace’s jubilation - Munaozongge. The news spread quickly among birds and got known by Jingpo ancestors, who followed suit to hold Munaozongge Gala of their own. Afterwards, Jingpo people have been prosperous with harvest of livestock and grains. They lived happily ever afterward. 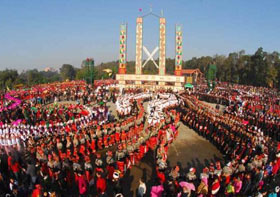 Now, the large-scale Munaozongge Gala is held on 15th of each year’s first lunar month. On the very day, people in full attires from all directions get together at the Munaozongge Square. To the accompaniment of drum, gong, and Lusheng (lú shēng 芦笙) pipe, they form two long queues, and led by "Naoshuang” (nǎo shuāng 瑙双), the pace-setter, they step in the dance arena. With joyous drum clangs and happy melodies, dancers flourish their swords, colorful handkerchiefs and fans, making full display of splendor and grandeur. More people join in and the dancing queues become longer and longer. Winding and wagging, the queues march forward separately now and mix and cross then. Dancers jostle each other but never lose their wholeness from head to tail of the queues. The queues, made up of a thousand people at the least and over ten thousand people at the most, move and roar like two dragons. This is the greatest group dance in the world and is called the world grandest dance. There is an airfield in Mangshi City of Dehong Region. Mangshi (or Fengping) Airfield is 6.5 kilometers away from the city proper of Mangshi. In Kunming there are 1-2 scheduled Flights every day flying to and from Mangshi City. The 470 -kilometer flight from Kunming to Mangshi will take you about 45 minutes and cost you 530 yuan at most. 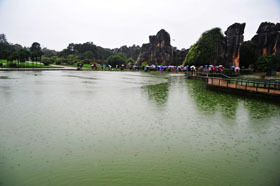 Tourists to Dehong Region will have to reach Mangshi City first and then transfer to Wandin, Ruili, Yingjiang and so on. No. 320 National Highway stretches across Dehong Region till Ruili and Nongdao, connecting all the cities and counties of the Region. If you go by car, you will have to travel 733 kilometers from Kunming to Mangshi and 827 kilometers from Kunming to Ruili. Sleeping buses and high speed buses set out from Kunming Long-distance Bus Station (0871-3544574) to Mangshi and Ruili every day. 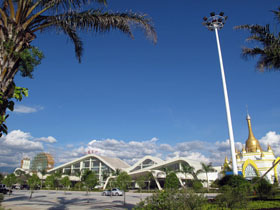 Dali Bus Station (0872-2125281) has also sleeping buses and ordinary buses to Mangshi and Ruili. The 8-hour travel to Mangshi will cost you 90 yuan, and the 10-hour travel to Ruili will cost you 100 yuan. In addition, you can also take buses at Tengchong Bus Station(0875-5152363) to Ruili. The 230-kilometer travel will cost you 36.5 yuan and last for 5 to 6 hours. The buses will go via Yingjiang. Although the road is paved with stones and thus is bound to be bumpy, the landscape along the road is wonderful. You can take long-distance buses at the Bus Station of all the counties to go to and fro different counties and regions. Unless you want to go outside the county seat, all the taxies will charge you only 5 yuan in Luxi, Ruili and Yingjiang. Sometimes you need to take special minicars to get to those remote beauty spots, and you can find nameboards for the minicars in the county seat. There are tens of minicars every day in Ruili to and fro the city proper and Jiegao Frontier Trade Economic Zone. The price for one ticket is 5 yuan. You can walk from Sino-Burma Frontier Trade Street to the city proper of Mujie.